A mercenary who is willing to take on and defeat Superhumans, The Deathmask. Considered one of the best in field of Superhuman Assassination, the Deathmask has the best record in Superhuman and Paranormal kills in the growing field of super mercenary work. A tactile and hands-on warrior, the Deathmask confronts his quarry head-on and is not shy in revealing himself to the public as a method of self promotion to boost both his demand and ego in demonstrating that he was the one who killed said superpower, starting with his systematic slaughter of San Diego's crime team, The FreeLancers and the public battle and death of Philly's iconic hero, The Patriot. Though is main operation is Superhuman Assassination, the Deathmask will take on execution orders on dignitaries, political and underworld leaders, and radicals, as they are merely the exhibition towards his main event, the masked hero. The Deathmask has been hired also by world governments in eliminating foreign superpowers as a method of controlling the escalating superhuman arms race. Even scarier is that the identity of the Deathmask is currently unknown, as the mercenary is as elusive as he is deadly, placing him on the Watchlists of Interpol, the FBI, CIA, MI6, and The SOTF (Superhuman Observational Task Force). Abilities: The Deathmask is a skilled martial artist and weapons specialist, showing skills in krav maga, jujitsu, and akido and proficiencies in long and short edge weapons. He demonstrates excellent proficiency in small and automatic weaponry, while also proficient in long-range weaponry. The Deathmask's suit is made of a combination carbon and kevlar armor weave with carbon nanotubule fibers, for enhanced protection, strength and power output. His cape and cowl are made from a memory cloth fiber with an optic-camoflague and glide function. The cape is attached to the main shoulder housing where it can retract and release on command. The Buckle and Shoulder Clasps are mini power generators that allow the Deathmask's suit to power its abilities while charge ports power up his main weapons. Deathmask wields a series of staves that house carbon "memory" polymers that, when channeled with an electrical current, manifest in various weapons, such as as words and axes. A mini battery in some Units enable the creation of throwing blades and unless a current is running through the staves, the polymers go inert and disperse. This prevents the Deathmask's own weapons from being used against him. The Memory polymers are not just limited to his staves, but are also housed in the knuckles on his gauntlets. 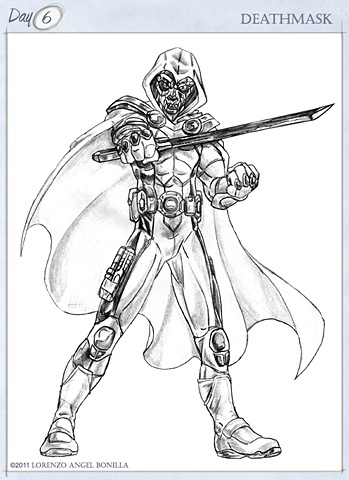 Creation: This character started off as my redesign of the Marvel mercenary, the Taskmaster. When I showed this to my friend, Carlos, he suggested that since I spent a lot of time and effort in designing this character, why don't I use it to create a new character, to which I did. While elements of the Taskmaster costume remain, I altered his boots and gloves, discarding his emblemic "T" on his belt, while adding new details on the uniform to finish the character.